The most obvious error of the 9/11 deniers (or "9/11 truthers," as they are also called) is in failing to falsify the claim that 9/11 was planned and executed by 19 Islamic terrorists directed by Osama bin Laden. Their other errors are detailed below. Many claims have been put forth by 9/11 conspiracy theorists, including those of David Ray Griffin in The New Pearl Harbor: Disturbing Questions About the Bush Administration and 9/11. A review of these claims is in order. His approach consists of asking disturbing questions, ignoring the actual evidence, speculating about the possible answers, assuming the worst-case scenario, and then drawing up his indictment of the administration based on his assumptions, even where they are in flagrant contradiction to widely-known facts. It is true that the idea that 19 terrorist conspirators with box cutters could take over four commercial airliners and successfully crash three of them into their targets at the World Trade Center and the Pentagon boggles the mind and raises a lot of questions. It raises questions about the quality of airport security we had at the time and about the things that had to happen in order for these terrorist conspirators to get into such a position to cause such damage. It raises questions about the kind of mindset such people must have had to engage such a plot. It raises questions about who financed and trained these suicide hijackers. Who planned the attacks? It raises questions about how they got into this country and how they learned to fly commercial airplanes. It raises questions about how they figured out that they could get box cutters through airport security and about why our government hadn't identified the threat these individuals posed. It raises questions about the conditions perceived by these Saudis and their allies that would drive them to commit such acts. But those aren't the questions the 9/11 truthers pose. I wonder why "9/11 truthers" don't want to give credit to the mostly Saudi-born Islamic suicide hijackers for planning and executing their unprecedented coordinated acts of terror. Do the truthers think that Muslim terrorists are too stupid to plan such an attack? If so, then they underestimate our enemies and overestimate the abilities of those in power in America. The "truthers" believe that the Bush Administration planned 9/11 from beginning to end. The al-Qaeda hijackers were either non-existent, innocent bystanders, or government agents. Many "truthers" believe the twin towers came down due to a controlled demolition. Griffin also claims that both UA Flight 175 and American Airlines Flight 11 were flown by remote control. What do the "truthers" have to say to the family members of those who were killed on those flights? Were they herded away by airline officials and CIA agents to Afghanistan where they were killed or now live as slaves? The fact is that the towers didn't come down as if in a controlled demolition. Controlled demolitions collapse from the bottom, not from the top. Both towers clearly collapsed from above the points of impact and pancaked the floors below. 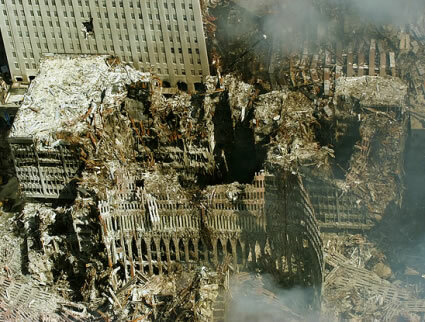 And, because of the angle of impact, the south tower didn't collapse straight down like the north tower did, which was impacted through the center of the building. Finding evidence of fire in an elevator shaft or on the ground floor doesn't mean bombs were set off there. Even if some explosions did occur, it is possible that some of the offices in those buildings contained explosives. I'm not saying they did, but if they did they need not have been placed there by government agents as part of a conspiracy to blow up the twin towers. The fact is that we still don't know with absolute certainty why the twin towers collapsed. There are theories, but we don't know for sure, even though we have a pretty good idea of why they fell. One thing Griffin and other "truthers" should have considered is that if the towers came down as part of a controlled explosion, wouldn't somebody have noticed the demolition experts nosing around the building for weeks preparing for the big day? And wouldn't the building have come down with the bottom floors collapsing first? Another thing Griffin and the "truthers" might consider is that if there were bombs set off in the North Tower, as some people claim, they may have been put there by al-Qaeda operatives. In any case, even if the buildings came down as if in a controlled demolition—which they didn't—that would not mean that Bush and his buddies planned the whole operation. For more on demolishing buildings by explosives, see ImplosionWorld.com. The "truthers" question President Bush's actions on 9/11 and his being at the Booker Elementary School in Florida when the first planes hit the World Trade Center. White House chief of staff, Andy Card, supposedly whispered to Bush that America was under attack but Bush kept reading to the kids at Booker Elementary instead of being immediately taken to a secret location by the Secret Service. To the "truthers" this proves that Bush knew he was safe because he knew the targets did not include an elementary school in Florida. I wonder why Card thought America was under attack. Why would he frame it that way? Wasn't he in on the plot? Maybe not. Anyway, two airplanes into the Twin Towers hardly constitutes an attack on the country. The 9/11 Report says Bush wanted to give the impression of looking calm. Maybe so. Maybe he didn't want to scare the kids. In any case, the "truthers' are speculating that Bush was putting his life in danger unless he knew that he wasn't a target. Maybe Bush didn't feel threatened because he knew that the twin towers were in New York and that he was in Florida. Maybe his quick mind put 2 and 2 together and he realized that he didn't need to worry about his safety since Florida is not in New York. Griffin and other "truthers"also question the claim that American Airlines Flight 77 flew into the Pentagon. They question that the plane could basically disappear "into the Pentagon with next to no wreckage and no indication of what happened to the wing sections." Griffin speculates that the Pentagon was hit with a guided missile or a military plane. Another conspiracy speculator, Thierry Meyssan (L'Effroyable Imposture [The Appalling Deception], 2002), also posited that no commercial plane hit the Pentagon. They based their speculations on how things appeared to them. It appeared to them that there was no debris left by Flight 77 and no hole in the Pentagon that fits where the plane hit. As one conspiracy buff put it: "The last time I looked at the real world, a solid object could not pass through another solid object without leaving a hole at least as big as itself." Good thinking, but the Boeing 757 isn't a solid object and it didn't pass through the Pentagon. Secondly, the last time I looked at the real world when a plane weighing more than 70 tons and traveling over 300 mph while carrying over 10,000 gallons of jet fuel crashes into something as solid as the Pentagon, the plane disintegrates. Meyssan finds it appalling that Flight 77, which struck the Pentagon at 9:43 a.m., was unaccounted for for some 40 minutes as it flew 300 miles over Ohio. L. Kirk Hagen points out that there were thousands of planes that had taken off from or were approaching airfields on the Eastern Seaboard. "It is remarkable that the FAA (Federal Aviation Administration) acted as quickly as it did," says Hagen. "As early as 9:17 a.m. it closed all airports in the New York City area, and by 9:40 a.m. halted all air traffic nationwide. Controllers had been monitoring Flight 77 as it approached Washington, and had even warned the White House." Meyssan, by the way, claims Flight 77 was shot down by a missile. Some conspiracy buffs claim that Flight 77 was a small plane loaded with explosives. Gerard Holmgren—another dedicated conspiracy theorist— has posted a debunking of the "paranoid fantasies" of the 9/11 conspiracy theorists and he has also posted his detailed analysis as to why a Boeing 757 could not have flown into the Pentagon. He gives quite an elaborate explanation, including all the physical dimensions of a Boeing 757 and a Byzantine set of calculations as to how big a hole such a craft should have put in the Pentagon. Shock of shocks, Mr. Holmgren couldn't find any public listing of the physical dimensions and structural properties of the Pentagon. Needless to say, I don't have them either, but I can guarantee you that the Pentagon is not built like a barn or a billboard, where, as we have seen in the movies, a plane leaves a visible impression of its wings and fuselage upon passing through. Nevertheless, Mr. Holmgren is certain there should have been a much bigger hole in the Pentagon than he can decipher from photos of the wreckage. He does many calculations, but his conclusion is based on the questionable assumption that the plane should have left a bigger footprint. None of his calculations can show such a thing unless he also assumes the plane did not disintegrate on impact. Then there is the matter of the disappearing wreckage at the Pentagon, of which conspiracy buffs have made much. Photographs taken in the immediate aftermath of the impact show no sign of airplane debris. That must mean that it was a missile that hit the Pentagon, implicating our diabolical government once again. Official accounts indicate that Flight 77 smashed through several of the concentric rings that make up the Pentagon, so that the wreckage all came to rest well inside the building. Kilsheimer's eyewitness account is backed up by photos of plane wreckage inside and outside the building. Kilsheimer adds: "I held parts of uniforms from crew members in my hands, including body parts. Okay?" But if there is so much evidence that a plane crashed into the Pentagon, why did CNN correspondent Jamie McIntyre report that he could find none? The answer is that McIntyre did not report this at all, and the 9/11 Truth Movement is once again selectively manipulating evidence to fit their conclusions. When McIntyre noted that no debris from a plane was observable near the Pentagon, he was responding to a specific question asked by CNN anchor Judy Woodruff during the segment. Flight 77 came in flying very low, and there had been speculation that the plane might have struck the ground shortly before reaching the Pentagon. McIntyre's response, when quoted in full, makes clear that he is saying that there was no evidence that the plane hit the ground before hitting the Pentagon, but he certainly does not deny that the plane struck the Pentagon itself. WOODRUFF: Jamie, Aaron was talking earlier -- or one of our correspondents was talking earlier -- I think -- actually, it was Bob Franken -- with an eyewitness who said it appeared that that Boeing 757, the American jet, American Airline jet, landed short of the Pentagon. "Omar Campo, a Salvadorean, was cutting the grass on the other side of the road when the plane flew over his head. 'It was a passenger plane. I think an American Airways plane,' Mr. Campo said. 'I was cutting the grass and it came in screaming over my head. I felt the impact. The whole ground shook and the whole area was full of fire. I could never imagine I would see anything like that here.'" - Pentagon Eyewitness Accounts. Read Father Stephen McGraw's eyewitness account. He wasn't interviewed for "Loose Change." Why? Because he saw the plane crash into the Pentagon. "The traffic was very slow moving, and at one point just about at a standstill. I was in the left hand lane with my windows closed. I did not hear anything at all until the plane was just right above our cars. The plane clipped the top of a light pole just before it got to us, injuring a taxi driver, whose taxi was just a few feet away from my car. I saw it crash into the building. My only memories really were that it looked like a plane coming in for a landing. I mean in the sense that it was controlled and sort of straight. That was my impression. There was an explosion and a loud noise and I felt the impact. I remember seeing a fireball come out of two windows (of the Pentagon). I saw an explosion of fire billowing through those two windows. Griffin and other conspiracy theorists believe Bush was behind 9/11 so he could take over the world. the "truthers" need no more proof than the fact that two days before 9/11 the Bush administration had finalized Afghanistan war plans and had placed 44,000 US troops and 18,000 British troops in Tajikistan and Uzbekistan. Could this be a coincidence? No, say the "truthers." The "truthers" seem to see the 9/11 attacks as a kind of Pearl Harbor, which happens to be in the title of Griffin's conspiracy book and can be referenced at p. 51 of Rebuilding America’s Defenses: Strategy, Forces and Resources for a New Century - A Report of The Project for the New American Century (PNAC) September 2000? ("Further, the process of transformation, even if it brings revolutionary change, is likely to be a long one, absent some catastrophic and catalyzing event – like a new Pearl Harbor.") The Bush cabal wanted to hurry up the process of world dominion by faking an attack on America. If so, I guess you could say that the plan failed. On the other hand, maybe the mastermind of the attack was a Muslim terrorist who became more convinced than ever of the rightness of the attack when he found out about our war plans for Afghanistan. Is there any scientific validity to the claims of 9/11 controlled demolition conspiracists about the collapse of the World Trade Center buildings? If nanothermites pulverized everything, then why did the debris pile include a 13-story high facade? If classic controlled demolitions create minimal damage to adjacent structures, then why did the Verizon Building suffer $1.4 billion in damages? If the South Tower tilted 22° at first, then controlled demolition experts could not have righted it mid-collapse. If nanothermites were used, then they would have spontaneously detonated at well under 1000° F. and would not have been controllable; no signal receiving device could have survived the fires and continued to receive the destruct command. Can the "truthers" find some engineers who support their position? Sure, but they're wrong. And what about United Airlines Flight 93? Did it really crash near Shanksville and Stonycreek Township in Somerset County, Pennsylvania, at 10:03:11 AM local time, with parts and debris found up to eight miles away? That's the official story. We don't know why that plane crashed where it did but it is widely believed that the hijackers deliberately crashed it there or lost control of the aircraft because of being attacked by passengers on the plane. Ask disturbing questions, ignore the actual evidence, speculate about possible answers, assume the worst-case scenario, and then draw up your indictment. Once you've made up your mind, it is quite easy to find confirmation for just about any belief, no matter how farfetched or implausible. A transcript of the Flight 93 cockpit tape is now available. I'm not going to try to interpret it or the sounds heard on cell phones. Read it and weep. Griffin is now on the lecture circuit. At UC Davis on December 5, 2008, he claimed that there were no Arab terrorists on any of the 9/11 planes. He claimed that the crash of Flight 93 was a fake. He says there was no debris and no human remains. I'd like to have seen Griffin tell that to Derrill Bodley, my colleague at Sacramento City College. Derrill's daughter, Deora, was killed in the crash of Flight 93. (Derrill was killed a few years later in a motorcycle accident.) There was debris from Flight 93 and remains were identified. Griffin also questions whether cell phones would work on the flights (a reasonable question), but the phones used on Flight 93 weren't necessarily all from cell phones; some were probably from air phones. (I don't know what to say about a man who tries to make his case by highlighting inconsistencies in the testimony of a young and distraught widow. For more on this cell phone dispute, click here.) He also claims there were no Arabs on the planes because the names of the terrorists were not listed by the airlines as being on their manifest. The Boston Globe did publish the full manifest (they had no quibbles about notifying the Arabs' next of kin). Mohamed Atta was assigned seat 8D in business class on American Airlines Flight 11, according to the Globe. Seated next to Atta in seat 8G was Abdul Alomari. That there were no hijackers listed on the manifests is a myth. Griffin seems to be making up his story as he goes along. Then there is the matter of Building 7. Larry Silverstein in a September 2002 PBS documentary said that the decision to "pull" building 7 was made before its collapse. "Pull," a demolition industry term for pulling the outer walls of the building toward the center in an implosion. Silverstein said there was a decision late in the day on 9/11 to "pull" the building because it was unsafe. It seems reasonable that they weren't talking about demolishing the building right away. The dust hadn't even settled from the towers and chaos reigned. Then the building collapsed in its own footprint, as if it had been intentionally demolished. I don't know why it collapsed. But it was very near two huge buildings that had collapsed after being smashed into by large airplanes full of fuel. It's just possible that some of the debris from those events had a major debilitating effect on nearby Building 7, more debilitating than FEMA thought. There may well have been explosions in Building 7; after all, there were diesel generators located throughout the building that were fed by pressurized fuel lines from large tanks on the lower floors. Conspiracy theorists claim that there were a few small fires in the building, but this not true. They ignore the south side of the building. It is insulting and demeaning to the friends and family of those who died as a result of the terror unleashed on 9/11 to build a conspiracy theory on the kind of speculation, selective use of evidence, willful distortion, and innuendo promoted by the likes of David Ray Griffin, Thierry Meyssan, Gerard Holmgren, and others with "high credibility." The evidence for this conspiracy isn't even up to the standard of evidence used to justify invading Iraq: that just prior to our invasion of Iraq it possessed weapons of mass destruction, that Saddam Hussein was in cahoots with al-Qaeda, and that he was trying to get the ingredients for a nuclear bomb that might be given to terrorists to use against the United States. This and other conspiracy theories that require hundreds or thousands of co-conspirators suffer from the implausibility that comes with expecting human beings not to blow the whistle on the project. The greater the number of people needed to pull off a hoax or a secret crime, the greater the probability that somebody with blow the whistle. Given the number of people who would have to be involved to pull off this crime of the millennium, the Bush Administration 9/11 conspiracy theory has to be off the charts on the implausibility meter. For example, think about the claim made first by Hezbollah, then spread around the anti-Semitic media and blogs, that 4,000 Israelis who worked at the World Trade Center were contacted by the Mossad, warned of the impending attack, and were all absent from work on the day of the attack. Right. Four thousand people are told that terrorists plan to blow up the World Trade Center and not one of them mentions this to the thousands of others who work there? Four thousand people keep their mouths shut about such "information"? Yet, despite the absurdity on its face of such a claim, many people still believe it's true and they can find a website to back them up! The obvious error of the 9/11 deniers is in failing to falsify the claim that 9/11 was planned and executed by 19 Islamic soldiers at war with the United States and directed by Osama bin Laden. Providing alternative explanations for hundreds of events is not the same as falsifying this claim. I'll conclude by reminding the conspiracy theorists that the fact that I or anyone else is unable to explain this or that piece of evidence, testimony, or fact is irrelevant to whether the Bush Administration concocted an elaborate plan to stage a murderous attack on our own people to justify stripping Americans of their freedoms and to help them get Congressional and public support for going to war against other nations. The lack of knowledge on the part of others shouldn't be taken as a free ticket to speculate in accord with your own beliefs. Like many others in the [Scholars for 9/11 Truth] movement, Mr. Jones sees a number of "red flags" in the way the buildings fell. Why did the towers collapse at speeds close to the rate of free fall? Why did they fall straight down, instead of toppling over? Why did World Trade Center 7, a 47-story high-rise that was never hit by a plane, suddenly collapse in the same fashion — fast and straight down — on the evening of September 11? A rather hefty report by the National Institute of Standards and Technology explains how high-temperature fires started by jet fuel caused the buildings' outer columns to bow in, leading to the buildings' collapse. But the conspiracy theorists complain that the report stops short of showing computer models of the collapses. Mr. Jones's hypothesis is that the buildings were taken down with preplanted thermite — a mixture of iron oxide and aluminum powder that burns hot enough to vaporize steel when it is ignited. Mr. Jones says that this hypothesis offers the most elegant explanation for the manner in which the buildings collapsed. He says it best explains various anecdotal accounts that molten metal remained pooled in the debris piles of the buildings for weeks. And he says it offers the only satisfying explanation for a weird sight captured in video footage of the south tower just before its collapse. Near a corner of the south tower, at around 9:50 a.m., a cascade of a yellow-hot substance started spewing out of the building. The National Institute of Standards and Technology says in its report that the substance was most likely molten aluminum from the airplane fuselage. But Mr. Jones points out that aluminum near its melting point is a pale-silver color, not yellow. By his reckoning, then, that spew is a thermite reaction in plain sight. Mr. Jones is petitioning Congress to release the raw data that went into the National Institute of Standards and Technology report. "If they just give us the data," he says, "we'll take it from there." Hence, in the world of mainstream science, Mr. Jones's hypothesis is more or less dead on the vine. But in the world of [Scholars for] 9/11 Truth, it has seeded a whole garden of theories. With regard to the thermite or nano-thermite hypothesis, see here. This notion has been thoroughly debunked; no need to repeat it here. A believer in the nano-thermite idea sent me to a site where it is claimed that one of three samples was collected "ten minutes after the collapse of the second WTC Tower." How anyone knows where that sample originated, or the other two collected the next day and about a week later, is anyone's guess. So, there are two problems here. Proving the samples were planted in the building before the towers went down and proving that these samples came from explosives that brought down the buildings. By the way, the fellow who sent me to the nano-thermite rubbish also let me know that "normal fires do not melt steel. I know this; I have a gas stove!" I didn't have the heart to tell him about the error in thinking there was molten steel to be explained. He wouldn't have believed me anyway. Debunking 9/11 Myths: Why Conspiracy Theories Can't Stand Up to the Facts (2006). editors of Popular Mechanics. Hearst. National Institute of Standards and Technology and the World Trade Center "The report concludes that the fireproofing on the Twin Towers' steel infrastructures was blown off by the initial impact of the planes and that if this had not occurred the WTC would likely have remained standing. The fires weakened the trusses supporting the floors making the floors sag. The sagging floors pulled on the exterior steel columns to the point where exterior columns bowed inward. With the damage to the core columns the buckling exterior columns could no longer support the buildings so they collapsed." 9/11 Truthers Foiled Again by Michael Shermer: What was that sewn up in [Umar Farouk Abdulmutallab's] underwear, the same superthermite that Bush operatives used to bring down the World Trade Center buildings with planted explosive devices?